Pangkor Sandy Beach Resort is a cosy little motel-style option, located smack dab on Pasir Bogak beach. Ad Book now! Rates from US$50.82++. Average rating 7.5 from 1,475 reviews. It packs a wallop of attractive amenities and a large pool into one neat tropical nutshell. Just 25 rooms are available and the grounds and rooms are kept immaculate, with staff friendly and attentive. The standard rooms are on the small size but heavy on creature comforts; hot-water showers, TV, air-con, WiFi, electric kettle and a mini fridge create the perfect little home away from home. The rooms also have a decent sized desk for those on a working vacation and breakfast is inclusive. The resort’s on-site restaurant, Sandy Spoon, is open daily and a few small local restaurants are within walking distance. 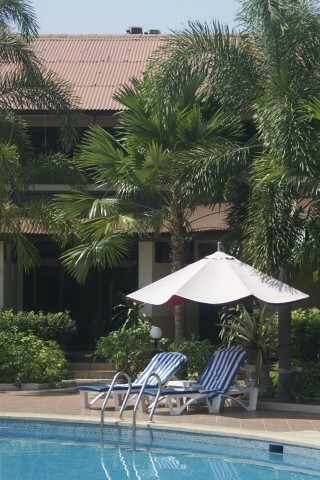 Check rates at Pangkor Sandy Beach Resort on Booking.com.